“I started painting a few years ago, but between homeschooling my kids, and painting very slowly I haven’t even managed to work on a dozen paintings yet. Since I hadn’t taken lessons or read books about paintin,g I worry about doing something fundamentally wrong so I am starting lessons now. “This is a piece that clearly demonstrates that you, as an artist, has a great technical skill with painting. You have some really fantastic lighting going on with a wonderful play on shadows, especially on that right wall. It creates a very eerie mood. I’m also really taken by this area with the animal’s head, you’ve depicted texture and lighting here so wonderfully and that’s really exciting. I’m very interested by your artist statement and would love to see you push the idea of public versus private, if you were to go forward and continue working with windows some more. I’m drawn obscure structure outside the window, and I’m almost craving just a little bit more information as to what it may be or what other things are occupying that space behind the window. Everything in this piece evokes curiosity as a lot of it is very specific and unique. 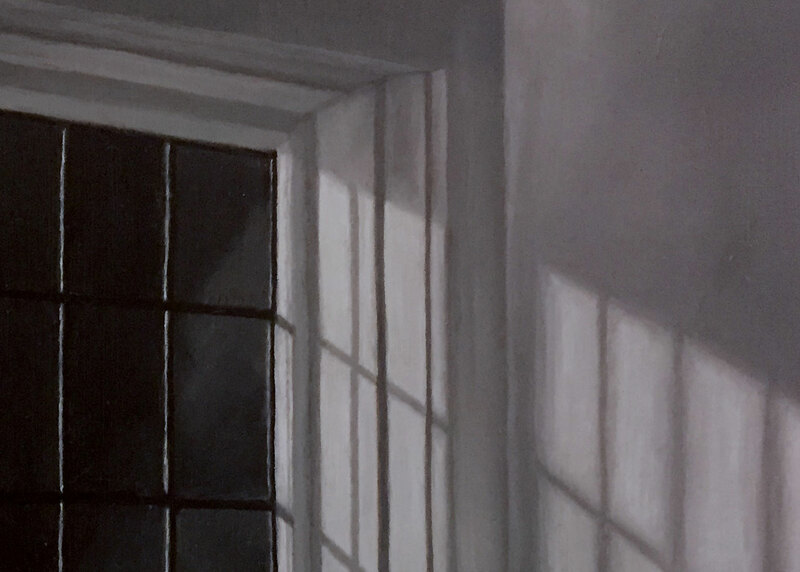 However, moving forward, I think that adding some even faint details in the very dark area on the other side of the window may be useful and also, might create a really great sense of depth. 8 responses on "Siobhan Wilder"
I absolutely love that between everything you’re finding time to make some work! I really love this piece because the atmosphere created by the light coming in through the window works so well. 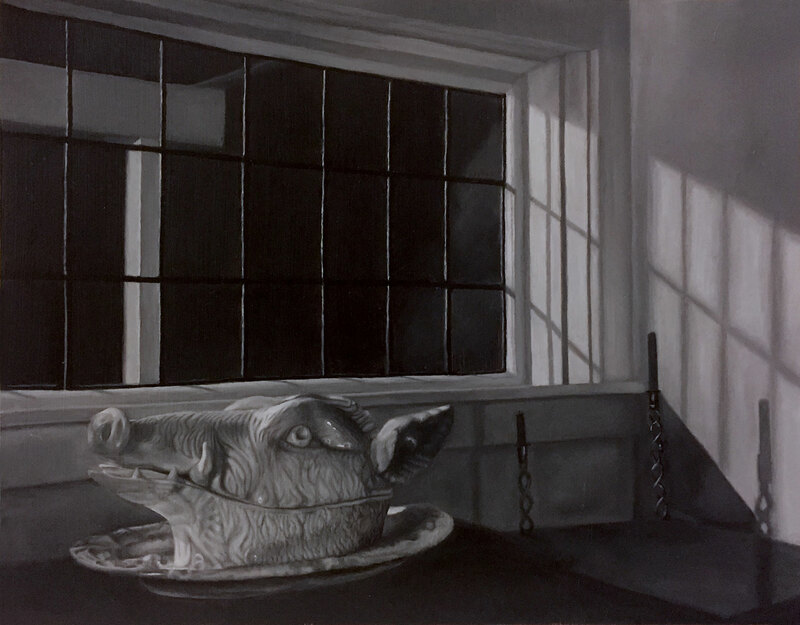 The high contrast on the window frame catches my eye in a perfect way and the brightness outlining them works well with the highlights on the ceramic boars head. I do wish there were some subtle shadows outside to help break up that space, and I feel as though the candle in the bottom right that is casting a shadow on the wall could have some highlights on the top of it to show where the light is hitting it. I wouldn’t worry about doing something fundamentally wrong, because as long as you’re finding fulfillment and working towards the goals you set for yourself you can’t go wrong. I think your interest in windows and the dialogues between inside and out is really interesting! Windows are always framing a view from the inside or from the outside, and it might be interesting to play upon how they can all give us different perspectives of the world. Whether it be in a plane, train, boat or building, they always lead us into a new atmosphere with it’s own story. If you want to work on perspective I would recommend looking up Piero della Francesca’s ‘Flagellation of Christ’. He was a mathematician and geometer during the early renaissance and was obsessed about perspective, and this particular piece of his is my favorite since everything is in perfect perspective. 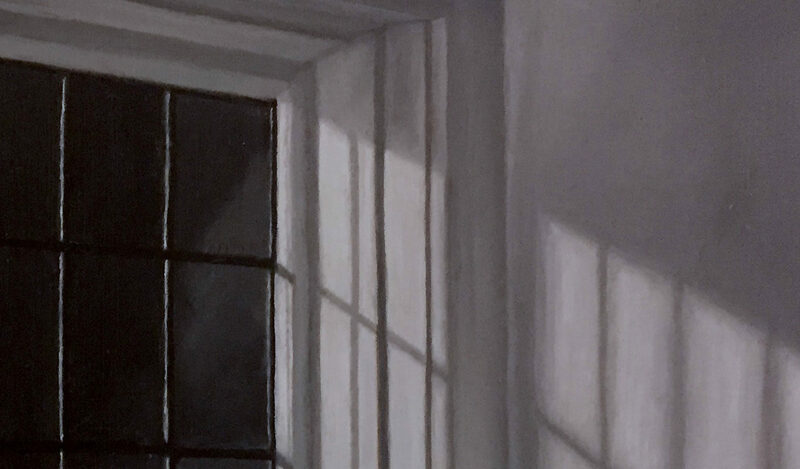 However it could also be interesting in some instances to make a piece that is in correct perspective, but through windows introduce a different view with a different vanishing point. Overall I love your piece and no matter how fast or slow keep up the good work! I’ve been watching a lot of Twin Peaks lately what with the reboot episodes that just came out. So maybe that’s why I feel like this painting has a totally Lynchian vibe to it. It does a great job of raising the hair on the back of my neck. I see a strong connection between your exploration of windows and worlds, and the Twin Peaks overlapping worlds of the White Lodge and the Black Lodge. Your choice of objects is so riveting. 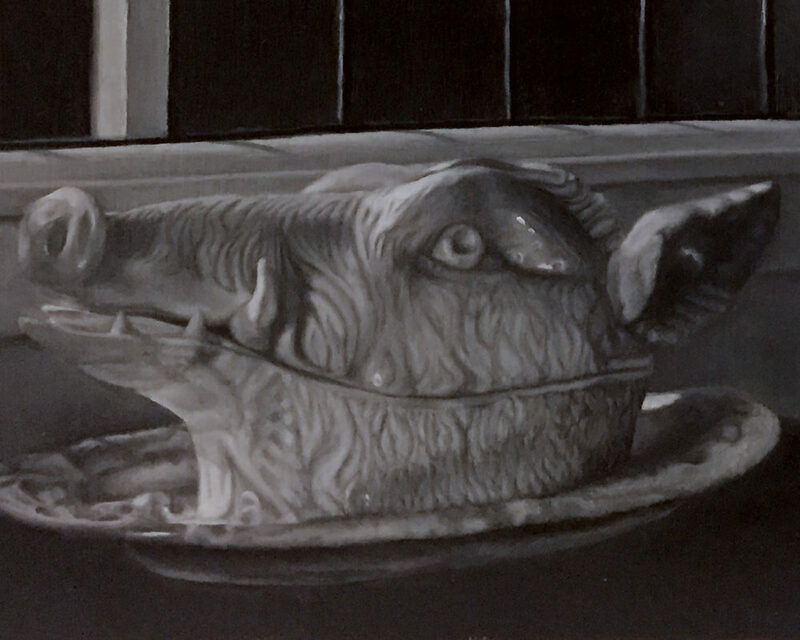 I find myself falling into the gap between the grotesque clarity with which you depicted the boar’s head, and the ambiguity as to why the boar’s head and candles exist in this space at all. There is a narrative connection between these objects and the window, but I don’t have the full set of information to make that connection. David Lynch works in a similar way, dropping strange objects, people, and phrases as clues. A log, an electrical outlet, creamed corn. If you haven’t watched the show already, I really think you should check it out considering the kind of work you’re doing! You also might want to check out Jeffrey Heiman’s paintings that use windows to talk about public and private spaces. I think both of you really have a mastery of combining still life, narrative, and and interior scenes! Thank you Lauryn, I will check both those out. The critique and all the comments are really helping me figure out where I want to go with this series, I’m very grateful! Thanks for sharing your Tumblr! Your work is so rich with ideas, can’t wait to see where you take your future pieces! There’s an eerie atmosphere in this painting which is absolutely riveting. I get the feeling looking at this scene that it’s unbearably quiet, as if you could hear a pin drop within this room. A large part of that effect is the captivating light which you’ve articulate so effectively. The architectural elements in the window are painted with tremendous precision which makes them very effective and convincing. The boar’s head is strange as well, it keeps me guessing about exactly what it is; it wasn’t until I read Casey’s above comment that I realized the option of seeing the boar’s head as being ceramic. 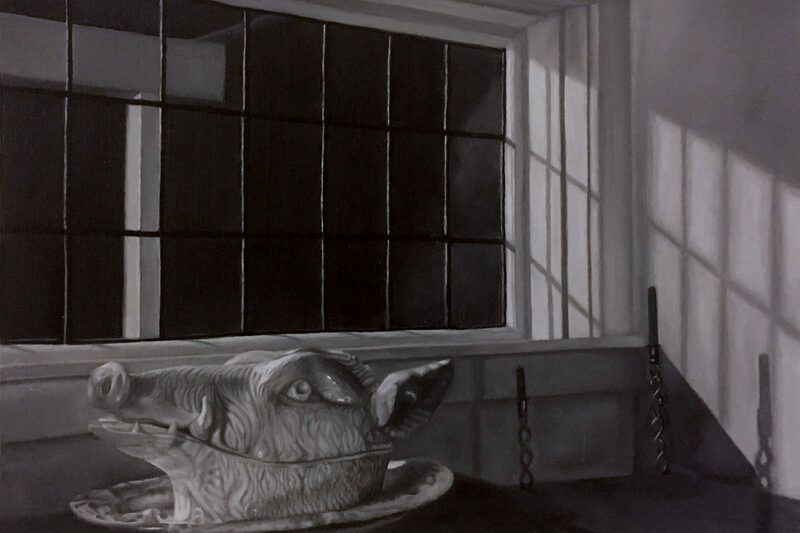 I read the boar’s head as a real boar’s head that had been dressed up, making for an even creepier scene! Moving forward I would love to see more varied degrees of articulation in your piece. You have outstanding painting technique, but in some ways your technique is a curse and a blessing. In your future work, ask yourself whether you HAVE to bring every part of your painting to such a full level of resolve. The elements that are outside the window might be even more mysterious of they were blurrier and not so full detailed. 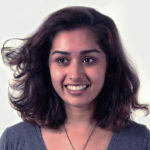 Can you get some of the crisper edges to be fuzzier and still achieve the same amount of visual information? Sometimes I think the toughest part of having excellent painting skills is knowing when to use it, because sometimes you actually don’t need to go that far. A really compelling piece, one that has an immediate impact and keeps me guessing! 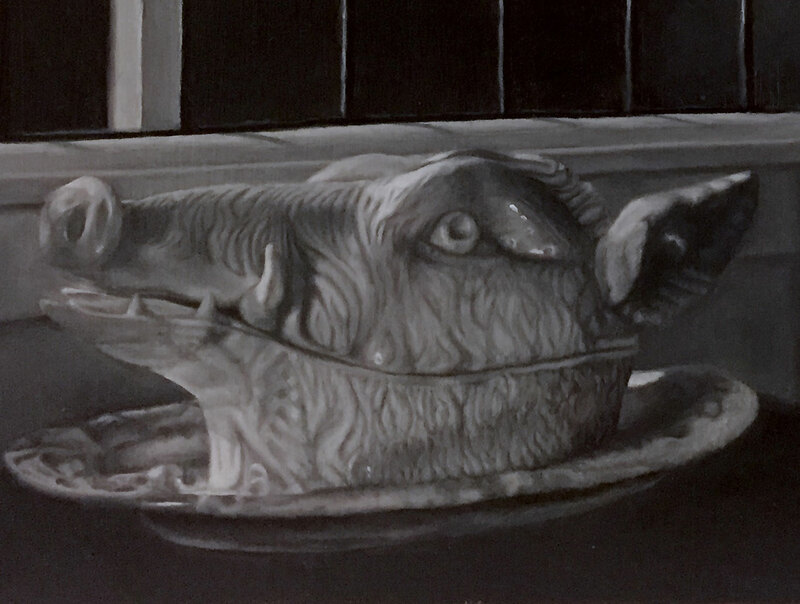 I am captivated by the mystery of this image… There are a lot of ambiguous elements here that you really could only convey effectively with a highly naturalistic approach, and so I’m impressed not only by your excellent technique but also by your confidence in capturing the nuanced lighting and texture of objects such as this ceramic boar head in the center of your composition. I’m particularly stunned by the few bright highlights you chose to bring out in that object, as those really perfectly describe the way light would work on that material, and it tells us immediately what we’re looking at. You have such great instincts in this regard that I would suggest pushing the surrealist aspect of your work even further in future paintings – taking advantage of your masterful grasp of the medium to really push the boundaries of what you can convey clearly and what you can obscure from the viewer. For example, the candle sticks in the foreground are rendered well for the most part, but it’s unclear where exactly they rest on the surface of the table, and could probably use more definition. On the other hand, the way you’ve handled the window frame – and the bold choice to set a black window frame against a black background – is extremely effective. The specificity of the bright highlights you include, set on top of an area of relatively low contrast, communicates so much depth to viewer while remaining very compelling and mysterious. Well done!